Arthur V Turner, (Topsy) that’s me in the photo, I served in the Firedrake from January 1937 till January 1939. In 1937 Firedrake patrolled off Spain when the civil war was on. 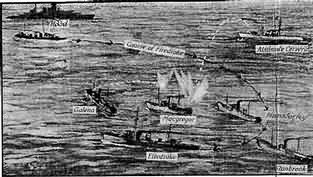 Once when we were escorting food ships with the Hood, through the blockade we were fired upon by the Spanish battle cruiser Almirante Cervera. 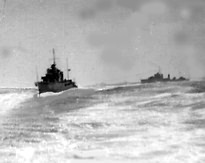 We cleared for action and there were some frantic flag waving going on between the Hood and the Almirante Cervera, the whole convoy stopped and waited, it was very tense, then the message came through from the Hood, proceed so we did, we escorted the food ships, the Hamsterley, Stanbrook and the MacGregor in to Bilbao, I took a cutting from the Daily Express April 24th 1937 showing the action. Photo left: The cutting from the Daily Express. Photo below: The Spanish Battle Cruiser 'Almirante Cervera' who fired on the Firedrake when escorting food ships through the blockade in 1937. My time with the Firedrake was a very memorable one, we were all very fit we played lots of sport, because it was peace time we had lots of competitions between the other ships. We won the Windsor Baton in Gibraltar a competition with ships of the 6th flotilla, and numerous other trophies, the Firedrake was a very happy ship. 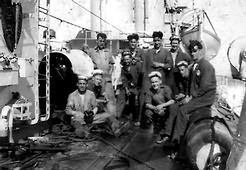 When the Firedrake was lost with 168 of her crew in 1942 I was very sad, I new a lot of the crew, even though I had left the ship 2 years earlier, there were still a lot of the lads that I had served with still aboard. When I was aboard the Firedrake I used to keep track of the places we’d visited, I wrote it all down on the back of a post card of the Firedrake, starting January till March 1937 Gibraltar, Palmas, Marseilles and Barcelona. From April to July, St. Jeandelus, La Pallice, Coast of Northern Spain, Portsmouth, Portland, Bristol, Torquay and Sandown. From August to November, Gibraltar, Balearic islands and Oran. In January 1938, we went to Portland, Gibraltar, Oran, Cartagena and Chatham we were there till the end of April, then we were off again, May till June, Portland, Weymouth, Torquay, Penzance, the Clyde, Cape Wrath, Scapa Flow and Lerwick. September till November, From Chatham to Rosyth via the West coast to Invergordon and Scapa Flow, on the card I had written CRISIS this referred to the troubles in Europe and the threat of War. Photo above: The post card that Arthur had written all the places visited when he was with the Firedrake. Pictures below: the crew of Firedrake and the (F) class on exercise in the Mediterranean. 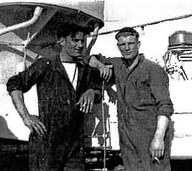 Bill Simmons, That’s me or scouse, as I was known on the Firedrake on the left with my mate Topsy Turner, sorry its not a very good photo but it isn’t exactly brand new, you know. I joined the Navy in 1934 at Chatham as a regular, after training I was assigned to HMS Calcutta, a "C" Class cruiser, and went out to the China Station, Wei-Hai-Wei, after about a year I was transferred to the Cumberland for a short time, then the Cornwall, and about a year after that transferred to the Kent. 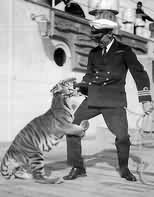 In 1936 we bought a tiger back to Chatham, we kept it in a large wooden cage we had built on the upper deck, leading seaman Hollis was the keeper, but when he went ashore I was left in charge, so I had to feed and water it. Hollis was a great bloke, he was leader of the ships mouth organ band, they once played for Charlie Chaplin and Paulett Goddard on the Empress of Japan at Singapore. 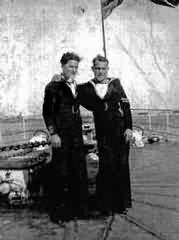 In May 1937 I joined the Firedrake as a torpedoman, I had some very happy times on her, she had a great crew all good lads, I had two very close mates Topsy Turner and Ginger Prandy, Ginger he was famous, he was the Navy’s featherweight Boxing Champion for 1937. He survived the war, and married the daughter of a manager of a café in Portsmouth and settled down. Topsy I haven’t seen him since I left the Firedrake. In 1937 we were on patrol duties off Spain, when the Spanish civil war was on, Firedrake had come under fire from the Spanish cruiser Almirante Cervera when escorting food ships through the blockade in April just before I joined her. The Firedrake had a very fit crew, we won the Windsor Baton at Gibraltar a competition we had between ships of the 6th flotilla, we had football, rowing, swimming, and boxing competitions, we also played darts and snooker matches, when playing football for the Firedrake I broke my leg, and was taken to the hospital ship HMS Main. When I was fit again I was assigned to the Shropshire as the Firedrake had gone back to the Home Fleet station at Scapa Flow the (F) class destroyers were now the 8th flotilla getting ready for war with Germany. I never saw the Firedrake again, I served on the Warspite for a time before she left for Norway, and then on the Liverpool on Russian and Malta convoys till we were torpedoed on a convoy to Malta, we had temporary repairs done at Alexandra, then went back to Rosyth to have the damage repaired and a refit. I moved on again, this time to minesweepers and finished my time on coastal duties. I served in the Far East, North Sea, Atlantic, Mediterranean and the Norwegian and Barents Seas. 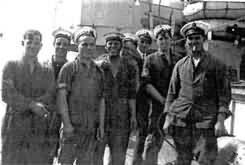 I served on HMS ships: Calcutta, Cumberland, Cornwall, Kent, Firedrake, Shropshire, Warspite, Liverpool and several minesweepers. The picture right: Is of the HMS Liverpool with the Bow blown off in Alexander harbour, waiting to be towed back to the UK for repairs. I was drafted again this time I found himself serving on a minesweeper.